In a few days time, Valentine's Day will be here. If you haven't made your dinner reservations, you better get on it. More importantly have you purchased that special gift that will make her melt? Flowers can be lovely as can a box of chocolates, but what about a gift that will last long after the Valentine's Day glow has faded. What about a piece of jewelry from Shadora? Shadora is jewelry company that offers you timeless pieces at amazing prices. All the pieces that are sold are well made, fashion forward and incredibly inexpensive. Most importantly, these pieces reflect elegance and longevity. An investment in a classic piece is well worth the purchase price. Shadora can offer the these pieces at a great value because there is limited inventory. By buying pieces and putting them on sale for just 30 days, the company can pass the savings onto the consumer. Now you can get quality pieces for your collection at reasonable prices. 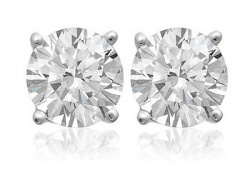 A great gift for the woman in your life is pair of stud earrings. Studs never go out of style. They are always appropriate and fashionable. With a casual outfit or a big night out, you can't go wrong with a pair of studs. I have a beautiful pair of white topaz stud earrings from Shadora. What I love about them is that I can wear them with anything. With a pair of jeans, these earrings add just the right amount of sparkle. For dressier occasions, these earrings add a simple elegance to the outfit. The versatility makes them a must have for anyone's jewelry collection. Would you like to add these white topaz earrings to your jewelry box? These are Two brilliant round-cut white topaz gemstones are secured in a four-prong setting of sterling silver, and secure with butterfly backs. Please use the Rafflecopter to enter. I would call my jewelry style either timeless. I wear a lot of simply things that never go out of style! I wear big jewelry,the bigger the better!! I love great big jewelry! These are really pretty! Very basic. My wedding and diamond studs (usually). I like timeless and classic.Thanks for the chance. I like to mix it up. Some days it's big and flashy other days it simple and understated. Plain and simple is how I like it! I like it just simple. Simple, but love to change up. I prefer dainty jewelry. I don't care for anything that is large or stands out too much. I like simple but sparkly. :-) Thank you. I love White Gold and Sterling silver, and I would say simple and some bling!